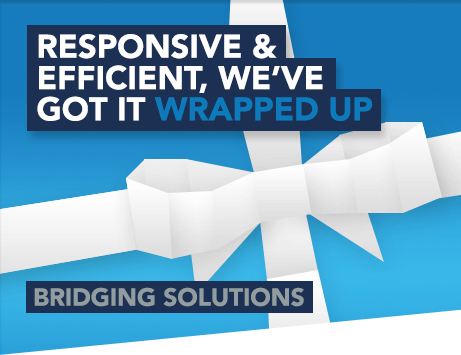 A bridging loan or bridging finance is a great solution for clients that need quick access to capital. It is a short-term interest-only loan to ‘bridge’ the gap – or in other words provide some breathing space – while other finance is secured. West One's bridging finance and its features broadly depend on what the loan is being taken out for. Our products generally fit into one of the following four categories but it's worth contacting us if you can't find what you need here. First charge bridging loan for primary principle residence. First and second charge bridging loans for those buying residential property. First and second charge bridging loans for applicants buying or refinancing commercial premises (or land). Bridging loans for those buying rental property that needs further development/ refurbishment. Where does West One get its funding for bridging loans from? What commission does West One pay to intermediaries on a bridging loan? A bridging loan is a short-term interest-only bridging finance loan available to those that need immediate access to capital. Usually used for a property purchase, it is a loan to ‘bridge’ the gap while other finance (such as a mortgage) is secured by the borrower. Bridging finance is secured, meaning the borrower uses property (or land) as security to the lending institution. West One receives funding through private investment. We use a variety of funding sources ranging from high net worth individuals through to traditional banks. All of our lenders are FCA elected. buy through a property auction. Bridging finance is popular with those buying property at an auction. Here, completion has to take place within 28 days which means traditional financing is not usually an option. No. We lend on residential, semi-commercial and commercial properties and land. The construction, type or use or the property doesn’t matter either. As a short-term loan, they are generally taken out for up to one year. However, it is not uncommon for some bridging loans to last for up to two years. Typically, the minimum amount that can be borrowed for a bridging loan is £30,000. The maximum amount of funding depends on both the value of the property used as security, and the loan to value. West One has lots of experience in lending multi-million pound sums. How long does it take for a client to receive funds? Each case is reviewed individually. However, if all the paperwork is complete then a client could receive funds in as little as 48 hours. From the initial enquiry through to completion, our average turnaround time is just two weeks. A credit check is not carried out by West One unless we are given permission to do so by your client. Once we receive the bridging finance application form (and the certified identification documents) we will issue indicative terms, which need to be signed by the client. We will then book a valuation. Once the valuation report is completed, we will instruct our solicitor to carry out all due diligence and provide a report. Funds will then be sent to the solicitor for completion. This depends on the individual circumstances of the borrower. However, the interest rate ranges between 0.55% to 1.5% for each month of the loan, and the borrowing is done on an interest-only basis.